T-Mobile today announced the immediate nationwide launch of HD Voice service across its entire network, a first in the U.S. The service promises dramatic audio quality improvement during phone calls. The service requires an HD Voice-capable phone at each end of the phone call. 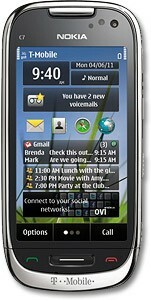 T-Mobile already offers several phones compatible with the service, including the HTC One S, Nokia Astound, and Samsung Galaxy S III. Sprint launched HD Voice last year, although only on parts of its network that have been upgraded to new tower equipment, a project still in progress. Nokia today announced the Astound for T-Mobile, a new name for the C7-00. The phone is largely identical to the C7-00 for the rest of the world, and will even say C7 on the phone itself, but will come with a slightly updated version of Symbian^3 that's faster, and has some pre-loaded software including Slacker radio and Swype predictive text entry, which works in both portrait and landscape modes. The phone sports an 8-megapixel main camera, 1.3-megapixel front camera with Qik for video chat, large nHD capacitive touch screen, and support for Wi-Fi calling. It will be available April 6 for $80 with two-year contract.